Every month Your Healthy Living gives you the chance to win a selection of fantastic natural health products in our free prize draws. On offer this time we have: Five readers will win a two-month supply of CardioMato, worth £36 each; three readers will each win a bottle of Micromax worth £39.95 ; six winners will receive a £50 voucher to spend in the GHN online store, plus every entrant will win a £5 voucher off a £15 spend; four readers will win two lip balms, worth over £5 each from the Good Boom vegan Skin Food glossy lip balm range; and three lucky readers will each win three packs of Dearest Fannie Ditsy Cloths and a pack of reusable straws, worth £47.50 in total. To be in with a chance of winning these prizes, simply tick the box for each prize draw you would like to enter and complete the short form at the end of the page. Good luck! By entering the competitions below you are allowing us to share your data with the individual advertisers offering the competitions, to allow them to pick a winner and if you are lucky, send prizes! They will only be able to use your data once and only to contact you about their competition. 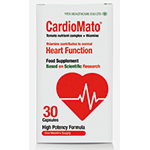 CardioMato contains natural Tomato Nutrient Complex™ + thiamine, which contributes to the normal function of the heart. Backed by new scientific research, CardioMato shows proven benefits and measurable results in just four to six weeks. Five readers will win a two-month supply of CardioMato, worth £36 each. 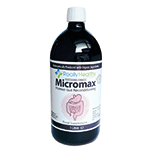 Micromax is a biodynamically fermented live gut food supplement containing over 30 species of aerobic and anaerobic microbes that can synergistically help optimise gut bacterial populations. The fermentation process used for this gut re-conditioner involves 40 different wild Alpine herbs and organic molasses (used up in fermentation). Three readers will each win a bottle worth £39.95. 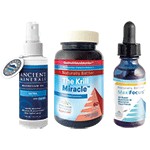 Good Health Naturally stocks a wide range of supplements and natural health products such as MaxiFocus, the Krill Miracle and Magnesium Oil Ultra. Six winners will receive a £50 voucher to spend in the online store, plus every entrant will win a £5 voucher off a £15 spend. Swedish brand Good Boom has launched its range of vegan Skin Food glossy lip balm colours. Meticulously sourced ingredients are designed to feed your lips with natural, organic goodness, all produced using green renewable energy. 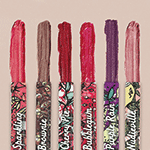 Four readers will win two lip balms, worth over £5 each. The Dearest Fannie Ditsy Cloth helps to cut down on waste, chemicals and money. It delicately removes all make-up with just water – you pop it in the wash and it comes out brand new. 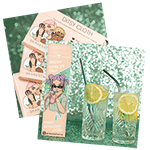 Three lucky readers will each win three packs of Dearest Fannie Ditsy Cloths and a pack of reusable straws, worth £47.50 in total. I also understand that I can Opt-Out at any time by contacting info@jfnproductions.co.uk. Full prize draw and competition terms and conditions. Enter more Your Healthy Living Competitions.